Hydroponics Water Dissolved Solids and Trace Metals. 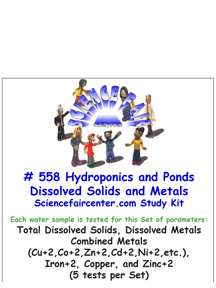 Natural Total Dissolved Solids and Trace Metals panel for hydroponic water studies. Hydroponics Water Dissolved Solids and Trace Metals. Water samples from hydroponic ponds are tested for Total Dissolved Solids, Dissolved Combined Metals (Cu+2,Co+2,Zn+2,Cd+2,Ni+2,etc. ), Iron+2, Copper, and Zinc+2 required for biological growth. Testing only takes a few minutes per sample. Each water sample is tested for this Set of parameters: Total Dissolved Solids, Dissolved Metals Combined Metals (Cu+2,Co+2,Zn+2,Cd+2,Ni+2,etc. ), Iron+2, Copper, and Zinc+2 (5 tests per Set). materials. These Copper test strips are suitable for testing drinking water and other water based samples for soluble copper ion. The EPA Primary Drinking Water Standard for Copper is 1 mg/L or 1 ppm. This test strip features a patented design for accuracy and lack of interferences. Use a water sample of at least 60 ml or 2 oz. 0, 0.5, 1.0, 2.0, 5.0 mg/L or ppm. Results are obtained from this test in about 3 minutes. Water samples from hydroponic ponds are tested for Dissolved Solids and Metals required for biological growth. Testing only takes a few minutes per sample.